Shiny waxed floors look great, but over time the wax can build up and result in a dull, dingy appearance. This is a guide about removing wax buildup on floors. 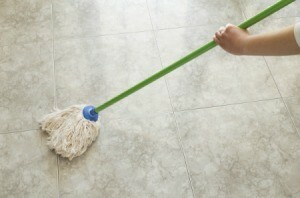 I want to remove the built up of wax on my tile floors without having to rent a machine. From dragging furniture, and people dragging their feet, the tile has light places and it looks awful. Do you know somwone with a small floor polisher. Any brand as long as the bottom is sealed. Open windows and pour straight ammonia on the area to be stripped, turn the polisher loose(with the stiff bristle brushes)and mop up the gunk. Works like a charm. Be sure to move any plants from the room too. The fumes can kill them. Go to a Lowe's or department store or something like that, buy a gallon of floor stripper. With a bucket you don't mind to use, mix water and stripper together. Use a mop to put the mixture on the tile, be generous with the mixture on the floor and be careful it will be very slippery! Let it set for 5 minutes or so, then use an SOS pad or scrubber pad on the end of a broom handle or mop handle and scrub, it will come up. If you do not get it up, there will be yellowish spots, which is remaining wax. Question: How can I remove wax build up on vinyl flooring? How can I remove wax build up on vinyl flooring? Open doors and windows and remove plants, then pour on pure ammonia and turn a floor polisher, with a sealed underside, loose on the floor and mop up the gunk. Works wonderfully. My brother used to be in the navy and told me that they scrub the deck with floor polishers as long as the motor isn't exposed on the bottom. Editor's Note: Ammonia will remove wax but the fumes are very strong. Make sure you have doors and windows open and good ventilation while it is sitting. Ammonia is what you use as Seamstress said. However, spread it on a section of the floor liberally, just pour some on and spread it, walk off for about 20 minutes and come back. It'll wipe right up. I used to own my own cleaning business and I've taken years and years of wax off this way. I used a product called Rejuvenate for my ceramic tiles. The master bathroom floor has dull blotches from this product. I am unable to remove the product from the floor. Rejuvenate has said to use a Windex product with out ammonia. That did not work. Has anyone used this product? Some of the tiles are OK and others look dull and have the appearance of water drops. I would not endorse the product. I also used Rejuvinate products. Tried everything they suggested. Hired Stanley Steamer and it came right off. Floors are clean and bright now. After removing the old wax with ammonia and washing the floor, will the floor need to be waxed again? Depends upon your preference, type of floor (wood, tile etc,), etc. Floor wax will help preserve the original floor finish and be easier to clean. Thanks for the reply I will give it a try and let you know. For removing wax build up, can I use a mop or a scrper to remove it? Will ammonia work without the machine? Use a wax stripper. Ammonia will work, but you do NOT want to use a scraper, use a mop. Buy a stripper product. Much easier. We have a no wax floor. For some reason, over the years mom used wax on it. It looks dull and dirty. How can I remove all the built up wax? Ammonia will remove build up wax on vinyl floors and brightens them too. Might have to get on hands and knees and scrub with cloth and changing the water frequently. Or you could go the slower pace using a mop with ammonia in the water each time you do the floors and eventually it will come off. To clean a very old square floor tiles people just moped, slapping wax along the wood trim and now I have bad wax and dirt buildup. How do I clean wax build up around the wall? Mop and Glow became a popular product. It caused a lot of build up on floors. The only thing I found to remove the layers was strong ammonia mixed in water and scrub away. The mop water was changed frequently as it clouded up, but the floor looked really good when build up was gone.